Hi! 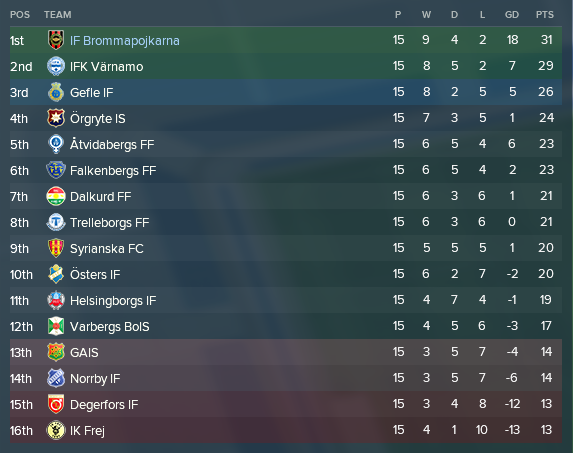 MikaelinhoFM here with the third episode of my first ever FM18 blog “The Bromma Boys” about Swedish talent factory Brommapojkarna. In the last episode (which you can find here) it became apparent that the club is seriously lacking when it comes to the economy, which meant that we basically had to settle with the players we had from the start. Luckily, we found a couple of hidden gems in the Academy. They may not be ready this season, but will surely play important roles in the future. In this episode we will look at the first half of the 2017 season in the Swedish 2nd tier Superettan. The Swedish leagues play spring-autumn, which means that the league starts and ends in the same year. In Superettan the teams play each other twice (home/away) with the top two teams gaining automatic promotion to Allsvenskan, Sweden’s premier division. The third team plays a playoff against the 14th placed team in Allsvenskan for another possible promotion spot. After a quite successful pre-season we go into the Superettan season as dark horses in the race for promotion. Even though we were just promoted from the division below in 2016 the media holds us as 3rd in line for winning immediate promotion to the Allsvenskan. Ahead of us they hold Helsingborg, relegated from Allsvenskan last season and Dalkurd, a financially strong team climbing swiftly through the league pyramid in recent years. Another thing pointing towards us being contenders for promotion is the fact that we have no less than three players in the “Media Dream Eleven” prior to the season start. 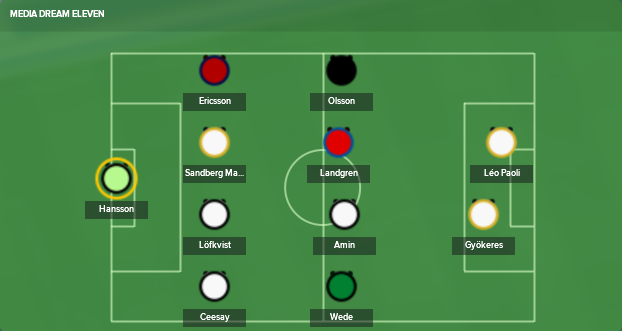 Our captain Sandberg Magnusson (playing CM for us), young star Gyökeres and new Brazilian signing Léo Paoli. We maintained our goalscoring form from the pre-season, scoring three goals in each of the first three games, giving us two wins and a draw. We stayed unbeaten for the first ten games until a sudden loss against local rivals and 14th placed Frej stopped our winning streak. A couple of games later our second loss came against 16th placed Varberg. 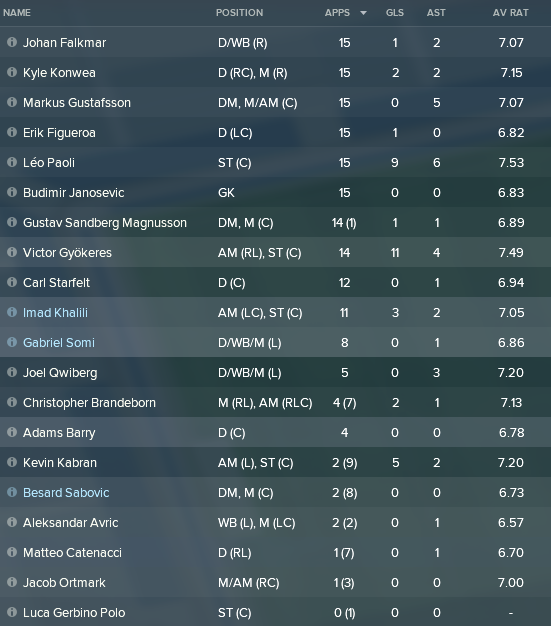 We managed to bounce back in the final game of the first half of the season, beating 1st placed Värnamo 4-1 after a hat-trick from Kevin Kabran. The win against Värnamo meant that we were top of the league heading into the summer break. Predicted rivals in the promotion race Helsingborg and Dalkurd were 11th and 7th. We beat the teams placed 2nd-5th but lost to two teams in the bottom. We are obviously struggling a bit when playing opponents that pack their defence! If the media predictions were wrong about the promotion contenders, they were certainly right when pointing out our most important players. Gyökeres with 11 goals and 4 assists and Léo Paoli with 9 goals and 6 assists really stood out in our first 15 games. The latter also started every game, together with five other players, including three players out of our back five. Khalili hasn’t really been the shining star I was hoping for, but 3 goals and 2 assists with a 7.05 rating in 11 games is at least acceptable. Every player in the senior squad got at least one start, except for mediocre Italian striker Gerbino Polo, who is not likely to start in the autumn part of the season either. We lost talented keeper Vestin to Lille, but we got a great deal. Aston Villa, Lille and two other decent European clubs started a bidding war for the signature of the 17-year-old valued at €6K. With Villa starting off with a €25K bid things escalated quickly with Lille coming out winners with a bid of €425K up front. The deal also included a friendly game at Grimsta and 40% of the profit from next sale. If Vestin lives up to his 5-star potential we might be talking some serious money! In the next episode we will look at the rest of the 2017 season. 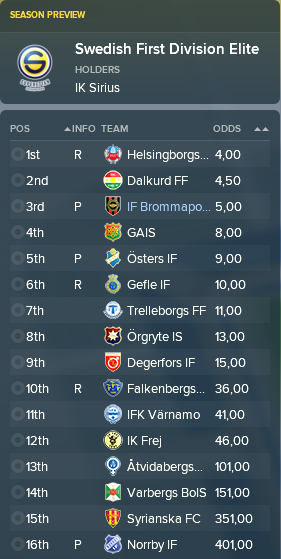 Will we gain promotion to Allsvenskan or will we bottle it and miss out? We will also focus on the youth intake, where new potential stars will join the talent factory! This entry was posted in FM18 Stories, Football Manager 2018, The Bromma Boys | @MikaelinhoFM and tagged brommapojkarna, fm stories, fm18, football manager, sweden. Bookmark the permalink.